CatanÂ® is a modern classic. An international favorite, it has redefined social board games. Now you can create Catan out of wood and enjoy settling and building using specially tooled wooden pieces. Embark on a quest to settle the fair isle of Catan! Guide your brave settlers to victory by using clever trading and development. Use resources (grain, wool, ore, brick, and lumber) to build roads, settlements, and cities, and buy development cards. Acquire your resources through trades or the role of the dice. But beware! You never know when someone might cut off your road or if the robber will appear and steal your precious gains. Are you the best trader, builder, or settler? 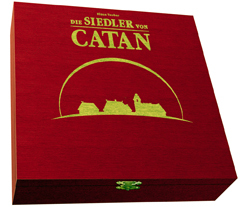 This special limited 15th Anniversary Wood Edition of The Settlers of CatanÂ® is designed for 3-6 players. The strong, compartmentalized box contains: 52 thick, beautifully illustrated map hexagons, 144 specially designed playing pieces, 6 hexagonal building costs summaries and 2 special victory point markers, 1 vile robber, 2 dice, and 28 random number chitsâ€”all made from sturdy wood. The 154 cards, like the hexes, bear fine artwork from Michael Menzel. Enjoy this special, limited productionâ€”suitable for travel or your nicest coffee tableâ€”with friends or family for many decades to come. 28 random number chitsâ€”all made from sturdy wood.